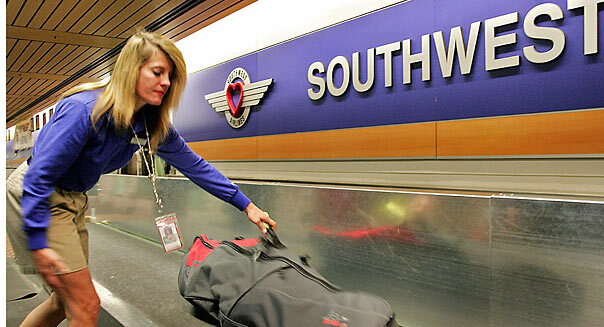 Southwest's Profits Dive: Could Checked Baggage Fees Be Coming? For years, Southwest Airlines (LUV) has taken pride in being the only U.S. airline left that lets travelers check two bags for free. But in the wake of Thursday's first-quarter earnings report, in which the airline reported a 40% dip in profits and cited lower-than-expected passenger revenue for March, we're wondering if it might be reconsidering that stance. The idea that Southwest would abandon its long-standing bag-fee policy isn't as crazy as it might sound. While Southwest and JetBlue (JBLU) have been the only domestic airlines not to jump unreservedly onto the baggage-fee bandwagon, Southwest has indicated in recent months that it could be wavering. In January, for instance, CEO Gary Kelly told CNBC that there were no plans to add fees in 2013, but added that he would "never say never." "The customers will tell us whether they would prefer to have extra fees or whether they would prefer to have everything bundled," he told the network. And with Southwest's profits starting to lag, it stands to reason that it may want to re-examine its business model. Fees have been a huge profit engine for the industry, with airlines making $3.4 billion on checked bags alone in 2011. If Southwest wanted to boost profits, charging for checked bags would be an obvious way to steer some extra cash in the coffers. Of course, doing so would also run the risk of alienating its customers, many of whom have been attracted by the consumer-friendly no-fee policy. As such, industry analysts suspect that the airline will try to find other ways to gin up revenue. "Southwest may explore instituting some 'fees,' such as fees to change tickets, which could help it generate revenue," says Henry Harteveldt, an airline industry analyst at Hudson Crossing. "The airline may view these types of fees as more acceptable to consumers, and less damaging to its brand and reputation, than charging to check bags." James Shillinglaw, editor-in-chief of industry trade publication Travel Pulse, agrees that such a move would do real damage to Southwest's brand. "The dip in profits could lead Southwest to start charging for first bags," he says. "But the airline has spent so much money on marketing the fact that they don't charge for bags that I doubt they would do so at this point." Southwest insists that isn't the case, with a spokesperson telling the Times, "We don't have a plan to charge for bags." Maybe not for now. But we're guessing the airline is giving it some serious thought. When Scott Ford was laid off from his job in New York City back in 2008, he headed to JFK International Airport without thinking of anything other than getting on a plane to visit friends in sunny San Diego. And when the Delta Airlines gate agent announced he needed a volunteer to be bumped from the flight because the plane was overbooked, Ford idly lifted his hand and accepted a voucher for a future flight. "Suddenly, it clicked," says Ford, a native of Dayton, Ohio, who now makes his home in Portland, Ore. "Since I was unemployed I had the free time and flexible schedule to travel as much as I wanted if I could find a way to afford it." As Ford accumulated travel vouchers and frequent flier miles by getting bumped from as many flights as possible, he developed a plan to spend every week of 2011 on vacation. While not every traveler has the time and flexibility to voluntarily miss a flight, Ford's experiences offer a blueprint that some fliers can use to garner some of their own free travel. Click through our gallery for Ford's top ten tips. Ford says that if you want to accumulate vouchers and frequent flier miles, it's much better to build them up with a single airline. You can also leverage your loyalty to the airline for extra perks and upgrades. Your likelihood of getting bumped increases when you travel when everyone else does, such as Friday and Sunday evenings or around holidays. Ford books as many connections as possible to increase the chances of being bumped on one or more sections of the trip. Before you book any flight, check the seat map to see how many empty seats are available or call the airline to find out if a flight is nearly full. Book your ticket on the flight that has very few seats left. If you can't always be flexible and offer to miss a flight, try to add some extra time to the beginning or end of each business trip or vacation when a few extra hours at the airport won't matter. If you're at the gate early, you'll have time to tell the gate attendant and the person at the check-in counter that you're available to be bumped. Ask the gate attendant as soon as you arrive if the flight is full and let that person know you're willing to be bumped if they need someone. Ask the gate attendant if there will be a "weight imbalance" on your flight. Instead of dumping too-heavy bags, the airline will sometimes reduce the plane's weight by bumping one or two passengers, says Ford. If you do get bumped, it's much easier if you only have a carry-on bag rather than having your luggage pulled from the flight. Alternatively, pack belongings for one night and meet up with your bag later. Always be calm and polite with the gate attendants so you're the one picked if there are several volunteers.